What to do when your camera's light meter doesn't work! The excellent Western Euro-Master light meter. How to use a separate light meter! Good rangefinder film cameras often come up for sale with their only fault being a dead light-meter. You can often get it going again with the right batteries, cleaning the battery contacts, or replacing the corroded wires inside the camera that run to the battery. 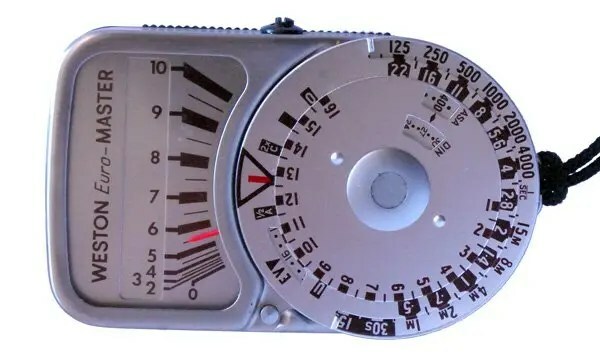 With the meter not working, provided the camera has a manual mode, it is still possible to use it by taking light readings with a separate light-meter. With old rangefinder film cameras like the Canon Canonets the manual mode is fully mechanical requiring no meter, or battery, for all of the film speeds to work correctly. Others like the Yashica Electro default to their fastest speed when the meter fails. It means you can still shoot with your Yashica Electro if the meter fails on a bright sunny day with ISO 400 film if you set the aperature to f16. Some old rangefinder cameras however only have auto exposure, and no manual mode, making them totally useless without batteries and a working light-meter. They can’t be used with a separate meter either as there is no way of setting the correct shutter speed and aperture combination. Examples of this type of old film rangefinder camera are the Konica EEmatic S and the Canon A35 Datelux. That why I prefer old rangefinder film cameras with manual controls. Up until the 1960s most cameras didn’t have light meters built into them. Everyone use separate light meters, or just guessed the correct camera settings. The early M series Leica rangefinders didn’t have meters. If you aspire to a Leica M2 or M3 you will have to learn to take separate light-meter readings and transfer them to the camera controls. Most of the older Yashica 6×6 TTL (Twin Lens Reflex) cameras don’t have meters either. These medium format cameras take big sharp negatives and were often used by wedding photographers back in the 1950s and 60s. The way the sunny 16 rule works is as follows: on a sunny day set the aperture to f16 and the shutter speed to a reciprocal of the ISO film speed for a subject photographed in direct sunlight. It is a lot easier than it sounds. Here are some examples: On a sunny day when shooting with 100 ISO film, set the aperture to f16, and the shutter speed as close as possible to 1/100th of a second, or as is the case with most cameras you would need to use the 1/125th shutter speed. When using the sunny 16 rule you can of course use a different combination of shutter speed and aperture if you wished. Instead of f16 at 1/125th of a second, you could set f8 at 1/500th. This aperture setting is two stops wider (which lets in more light); combined with a two stops faster shutter speed (which lets the light in for less time). The film exposure would be the same though the later setting would give a little less depth-of-field. If you have ISO 200 film in the camera on a sunny day, set the aperture to f16 and the shutter speed to 1/200th or 1/250th of a second. Finally if shooting with 400 ISO film on a sunny day, set the aperture to f16, and select a shutter speed of 1/400th or 1/500th of a second. In each case in the examples above if the conditions were overcast you can open the aperture up a stop or two. With practice this works reasonably well particularly with negative film which can be pushed a stop or two during developing. The second method involves using another camera with an accurate working light-meter to take a light reading and then transferring the reading to the meter-less camera. This method does of course mean you have to lug around a second camera. I have done this quite a bit in the past with great success. My metering camera of choice being a rather heavy Nikon 801. Just remember to set the film speed on the camera you are using for taking your light readings to the same as that on your meter-less camera with the film in it. The third method for setting correct film exposure is to use a separate purpose made light-meter. If you already have a liking for old film cameras then this method, although slower than using a built-in camera meter, may well appeal to you. A separate selenium cell light-meter, which requires no batteries, such as the excellent Western Euro-Master, can be purchased nowadays in near mint condition for next to nothing! I have used this particular meter quite often. Although at least 30 years old it is surprisingly accurate alongside my Nikons. There are plenty of old selenium cell light-meters from different manufacturers available. Be aware that some may be inaccurate. Check their camera setting recommendations against a known accurate light-meter, or camera with an built-in meter. Some old light-meters can be fiddly and quite hard to read even if their light readings are accurate. Using old light-meters does require a bit of skill when measuring reflected light (the light reflected back from the subject). Even a slight tilt of a few degrees when measuring reflected light effects the amount of light falling on the meter. It is better to use an invercone to measure incident, or ambient, light in most cases. This is light straight from the source – usually the sun. Put simply you aim the invercone at the sun and take a reading. So long as the sun is shining on the subject this method is practically fail safe. 1 Comment on "What to do when your camera’s light meter doesn’t work!"